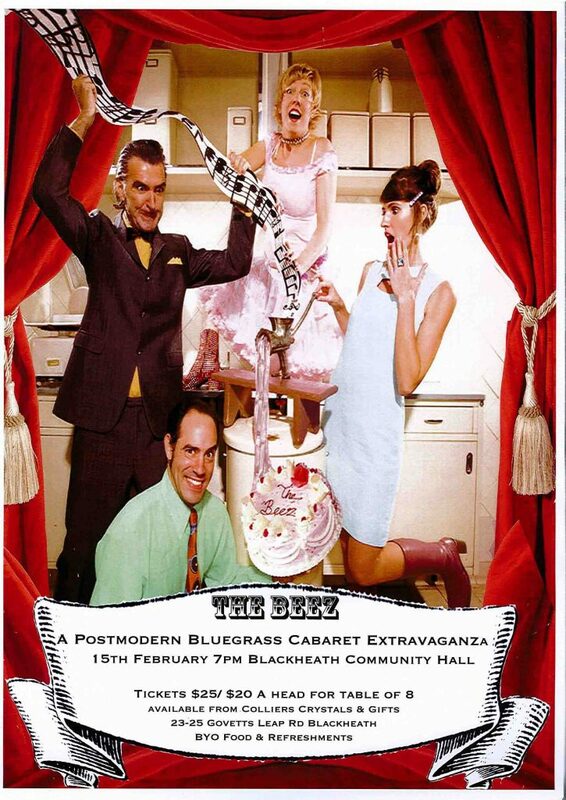 For one night only Berlin Band “The Beez” will be performing their eclectic mix of DIY Bluegrass German Cabaret at the Blackheath Community Hall on the 15th of February. Some of you would member The Beez from their very popular shows at the Clarendon and Blue Mountains Music Festival, Tamworth Country Music Festival or as Guest House Band on the ABC’s Spicks and Specs. For a little taste please see http://www.youtube.com/watch?v=pQgVtjEKsVE . The event will be a BYO sit down cabaret style night with plenty of room for dancing as the night goes on so feel free to bring a hamper and your favourite refreshments of choice. Tickets are $25 for singles or $160 for a full table of 8. Tickets are available through the Colliers Crystals and Gift Shop in Blackheath or shoot me an email and I can arrange them from HQ. Prepay tickets only I’m afraid. Doors open 7.00 For a 7.30 start.